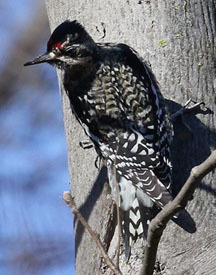 We had three uncommon to rare avian (bird) occurrences this week in the watershed or on the verge. Weather irregularities such as strong fronts or storm winds can push or pull birds from their normal range. The autumn migration of raptors has slowed considerably. 11/23 - Croton Point, HRM 35: In mid-afternoon, a single cave swallow was seen and photographed by Karalyn Lamb at Croton Point. The photo was later confirmed as being a cave swallow by Michael O’Brien, among others. 11/23 - Albany County, HRM 135: There was a large bobcat sunning itself at the north end of Basic Creek Reservoir in the Town of Westerlo today - a “life mammal” for me. 11/23 - Poughkeepsie, HRM 75: While stopped at a traffic light in Poughkeepsie, I noticed a cloud of ring-billed gulls flying in and hovering over crabapple trees. It appeared that they were eating the crabapples! 11/23 - Bedford, HRM 35: This was another day at the Chestnut Ridge Hawkwatch where hopes were high but things never materialized. Whether the winds were too strong or the birds weren't moving, there wasn't much to see. High count was 11 turkey vultures (season’s total 2,636). Non-raptor observations included 36 Canada geese. 11/24 - Lake Champlain: A Pacific loon was spotted among numerous red-throated and common loons on Lake Champlain in New York waters. 11/24 - Saratoga County, HRM 164: On Day 123 for the gray seal trapped above tidewater, Shannon Fitzgerald e-mailed me excitedly announcing “He's here! He's here! He is swimming directly behind my house in real time!” After more than a month of no sightings, we had begun to presume that the seal had escaped down river through the open Lock One of the Hudson-Champlain Canal. While this was encouraging news for the seal, Lock One was now closed for the season and with the river destined to freeze over, its survival might be problematic. 11/24 - Delmar, HRM 143: I had a female purple finch in my backyard next to the Five Rivers Environmental Center today. There was just one and it did not come to the feeders. 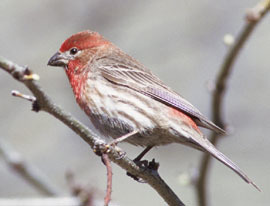 We have seen house finches every day and I wonder if they are making a comeback? 11/24 - Bedford, HRM 35: A few kettles of turkey vultures (32) in the distance to the southeast made up the bulk of the count today at the Chestnut Ridge Hawkwatch. We also counted four red-shouldered hawks. Non-raptor observations included 23 Canada geese. 11/25 - Saratoga County, HRM 180: Among the birds I counted on my survey of Galway Lake today were 700 Canada geese, 450 mallards, 270 hooded mergansers, and four ruddy ducks (last time there were 75; many have moved on). 11/25 - Saratoga County, HRM 164: On Day 124 for the gray seal trapped above tidewater, the river at Lock One provided an escape route if the gray seal chose to take it. The normal drop over the dam (about 12 feet) was now reduced to small water slide, a slight incline that might have beckoned the seal to take. If he did, it would a one-way ride and now he would be trapped between Lock One and the Federal Dam at Troy about ten miles downriver. Access to the latter dam is blocked off so the seal would not have the option of going over into tidewater. 11/25 - Green Island, HRM 153.4: There were many gulls on the river below the Federal Dam this morning and an adult bald eagle was perched along the shore just below the hydroelectric plant at Green Island. She seemed to be watching them. After a while the eagle took off and appeared to chase a gull, unsuccessfully. After a short ride around the river, the eagle returned to her perch, put her head back and let out a cry as though it was frustrated (gulls are far too agile to be caught in the air by an eagle, unless they make a mistake!). This was a New York-born bald eagle as well, with a blue band on its right leg and a silver U.S. Fish and Wildlife band on its left leg. I was unable to discern the letters or numbers on the bands. 11/25 - Beacon, HRM 61: On Thanksgiving Eve, with the full moon just rising over the eastern hills like a huge orange globe, we walked onto the low tide beach at Long Dock to give thanks to family, friends, and fish. We sampled the river with our seine and the bag of our net filled with spottail shiners 92-112 millimeters [mm] long. These are not glamour fish like striped bass, but they are still a native species that was named for the Hudson River (Notropis hudsonius). The river had cooled to 48 degrees Fahrenheit as I discovered when my hip boots shipped a few gallons of water. 11/25 - Crugers, HRM 39: The water of Oscawana Pond was very clear today and the surface flat – unlike how it was all summer, tangled with spatterdock. We spotted a beautiful pair of hooded mergansers. The gorgeous drake swam around calmly while the hen splashed up and down in the water. 11/25 - Bedford, HRM 35: Our eighth golden eagle of the season was today's highlight at the Chestnut Ridge Hawkwatch. There was also a good count of red-shouldered hawks (12) for this late date. Non-raptor observations included 48 Canada geese, a common loon, and two common ravens. 11/26 - Wappinger Creek, HRM 67.5: We counted more than two dozen common mergansers along the tidewater reach of Wappinger Creek, most busily feeding. A few took off displaying their bullet-like profile, a feathered projectile. Unlike last week when the sexes were mixed, these were all hens. 11/26 - Bedford, HRM 35: Only 13 birds counted today at the Chestnut Ridge Hawkwatch. High count was six turkey vultures. We also saw our one-hundredth bald eagle of the season. Non-raptor observations included ten Canada geese and two common ravens. 11/26 - Queens, New York City: The two American white pelicans, first reported by Robert Proniewych on November 17 on the East Pond at the Jamaica Bay Wildlife Refuge, were still there and have been joined by a Eurasian wigeon and blue-winged teal among the notable waterfowl. 11/27 - Columbia County, HRM 127: The air temperature was a balmy 64 degrees F today during my survey of the Town of Stuyvesant. Among the 19 species of birds I counted were 300 red-winged blackbirds and a northern harrier, but only six Canada geese despite the many harvested cornfields. 11/27 - Columbia County, HRM 122: By later in the day the air temperature had risen to 65 degrees F. It was high tide on the Hudson River and two adult bald eagles were content to perch side-by-side at the north end of the Middle Ground at Stockport Flats. These were local birds, a mated pair. 11/27 - Beacon, HRM 61: Today’s effort on “Black Friday” produced my season’s largest carp: 18 pounds one ounce, 32 inches long with a 22-inch girth. I lost another one, or possibly a large channel catfish when the hook pulled out. There were also three brown bullheads, a golden shiner, and lots of bait being stolen off the hook. There was considerable general fish activity. 11/27 - Bedford, HRM 35: Not a lot of movement throughout the day at the Chestnut Ridge Hawkwatch. High count among the 20 birds was 15 turkey vultures. The highlight, however, was a peregrine falcon that flew out in front of the watch in midday for many to see. 11/28 - Saratoga County, HRM 182: Among the birds I counted on my survey of Saratoga Lake today were 900 Canada geese, 26 American black ducks, 250 mallards, 45 common goldeneye, two common loons, and 150 bufflehead in a large raft at the south end of the lake. 11/28 - Columbia County, HRM 132: Every fall, the outlet gate to the dam on Kinderhook Lake in Niverville is opened in order to lower the depth by about four feet for the winter. Again this autumn (aquatic vegetation control). Lately I have been seeing local bald eagles drawn to the shallower water for easy fishing. 11/28 - Dutchess County, HRM 96: A small flock of rusty blackbirds was moving along Lake Road in Pine Plains, between Twin Lakes and Stissing Lake. These were skittish birds and the rain and gloom did not make ideal conditions for photography. 11/28 - Catskill Mountains, HRM 112: We were driving home from Walton in the Catskills this evening when we saw a fisher on the side of the road heading into the woods. 11/28 - Millbrook, HRM 82: The landscape was barren winter but the weather was pure spring, continuing an unusually warm fall. The warmth had apparently caused many plants to simply skip winter, with the sweet birch, lilac, and peaches all beginning to open their buds - snowdrops were pushing their way through the maple-leaf mulch. 11/28 - Bedford, HRM 35: Due to poor weather conditions at the Chestnut Ridge Hawkwatch, only four turkey vultures were seen passing through. Non-raptor observations included eight Canada geese, one belted kingfisher, and a common raven. 11/29 - Saratoga County, HRM 164: Day 128 - It had been four days since the surprise sighting of the gray seal, apparently still trapped above tidewater. It may still be here, or it may be below the dam at Lock One. If the seal took the shallow “water slide” over the dam with the strong current it could be down river. Our concern is that time is growing short; ice will be covering the river before long. 11/29 - Bedford, HRM 35: We had only a single raptor spotted today at the Chestnut Ridge Hawkwatch, a red-tailed hawk (season total 216). As the end of the season is only a few days away, the birds seem to be acting appropriately. Non-raptor observations included 15 Canada geese. 11/29 - Brooklyn, New York City: I came upon and was able to photograph a bright male painted bunting just south of the rink at Lefrak Center in Prospect Park. 11/30 - Delmar, HRM 143: During my survey of Five Rivers today I counted 13 species of birds, but the most impressive sighting was the 11 snow geese that passed in a flyover. The Five Rivers Skeeter Bowl was two-thirds covered with skim ice. 11/30 - Town of Poughkeepsie: We visited the vicinity of bald eagle nest (NY62) in mid-afternoon. We saw no eagles in their usual spots so we went exploring. Near the river we found both adults (female banded N42) perched in separate trees facing the water. As we watched, the male flew low over the river, dipped, grabbed a small fish, and returned to his perch. The mated pair resumed their river watch. 11/30 - Wappinger Creek, HRM 67.5: What a difference the tide makes. Yesterday at high tide, the entire mile-long tidal reach of Wappinger Creek was vacant. This morning at low tide, 17 ring-necked ducks, two dozen common mergansers, five hooded mergansers, and an assortment of puddle ducks (blacks and mallards) were actively feeding in the shallower creek - the diver ducks on fish and other aquatic life; the puddle ducks likely on vegetation and smaller aquatic life. Low tide makes for far easier access for foraging waterfowl. 11/30 - Bedford, HRM 35: Another slow day at the Chestnut Ridge Hawkwatch might have brought through the last of the migrants. Five turkey vultures and a red-shouldered hawk (season total 319) rounded out today’s count. Our only non-raptor observations was a common raven. 11/30 - Brooklyn, New York City: The resplendent male painted bunting that showed up in Prospect Park yesterday was still being seen this morning. There were visible clues to help us determine if the bird had been held in captivity and then escaped. 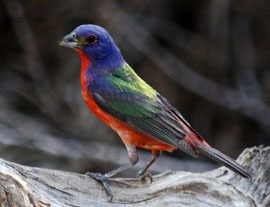 Like the Pacific loon and cave swallow reported earlier in the week, this painted bunting seemed to be an extralimital, a bird that has simply strayed far outside of its usual range. Painted buntings have a tendency to wander this time of the year, but those are mostly young birds, not adult males like this one. However, it does fit the pattern. Saturday, January 23: 3:00 p.m.
Hudson Valley Bald Eagles - One of our greatest ecological recoveries: presented by Tom Lake, NYSDEC Hudson River Estuary Program naturalist, at the Guilderland Public Library, 2228 Western Avenue, Guilderland [Albany County]. Sponsored by the Audubon Society of the Capital Region (ASCR). For information email: president@capitalregionaudubon.org. To subscribe to the Almanac (or to unsubscribe), go to DEC's Email Lists page, enter your email address, and click on "Submit." Fill in and submit the requested information on the “New Subscriber” page. This will take you to “Quick Subscriptions”. Scroll down; under the heading "Natural Areas and Wildlife" is the section "Lakes and Rivers" with a listing for the Hudson River Almanac. Click on the check box to subscribe. While there, you may wish to subscribe to RiverNet, which covers projects, events and actions related to the Hudson and its watershed, or to other DEC newsletters and information feeds. The current year's issues are available at http://www.dec.ny.gov/lands/25611.html . To view older issues, visit the New York State Library's Hudson River Almanac Archive. If it asks you to login, click on "Guest." You may then need to reopen this page and click on the Almanac Archive link again to access the Almanac collection in the library's files. For real-time information on Hudson River tides, weather and water conditions from eight monitoring stations, visit the Hudson River Environmental Conditions Observing System website. Visit the U.S. Geological Survey’s Hudson River Salt Front website for historical information on the salt front’s movements in the estuary.